If you’re deciding between the 2019 Jeep Cherokee vs the 2018 Ford Escape, there’s plenty of factors that should be considered before settling for one or the other. Personalization capability and performance potential are two significant details drivers should be aware of when shopping for a new SUV, and that includes the 2019 Cherokee and the 2018 Escape. Both vehicles are available in ten exterior color options. While this may lead some drivers to assume both vehicles are equivalent in terms of personalization, breaking down the trim level availability between the two reveals otherwise. The 2019 Jeep Cherokee can be purchased in one of five trim levels (Latitude, Latitude Plus, Limited, Trailhawk and Overland) while the 2018 Ford Escape is offered in only four (S, SE, SEL and Titanium). The 2019 Jeep Cherokee and the 2018 Ford Escape both utilize three engine options. Drivers looking for the best possible performance will want to go with the 2019 Jeep Cherokee and its available 3.20liter V6 engine. This powertrain generates 271 horsepower, more than the 245 horsepower found in the 2018 Ford Escape Titanium’s turbocharged, 2.0-liter, four-cylinder engine. Another advantage the 2019 Cherokee has over the 2018 Escape is the availability of a dedicated off-roading trim. The 2019 Jeep Cherokee Trailhawk features 17-inch wheels with all-terrain tires, a refined suspension tuned for off-road travel and increased ground clearance. Available 2019 Jeep Cherokee convenience features include: Eight cargo tie-down loops, a 12-volt cargo power outlet, air conditioning, air filtering, a day/night rearview mirror, driver seatback storage, a humidity sensor, heated steering wheel, overhead storage bin, a power liftgate and a tilt and telescopic steering wheel. 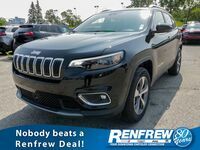 Interested in a 2019 Jeep Cherokee?